Addressing BJP Karyakarta Sammelan on the occasion of completion of 13 years in power by the Raman Singh led BJP government in Chhattisgarh on 12 December, 2016 in Raipur BJP National President Shri Amit Shah said, the BJP-led NDA government has given the country a “Prime Minister who speaks”, as against Manmohan Singh, “whose voice the people of this country had never heard”. He said the BJP believes in politics of performance that ensures repeat mandate for the party in various States. The Opposition, howsoever strong agitation it might launch, BJP’s position on demonetization will not change, he said. “During the Congress regime of 60 years, the nation suffered from paralysis of black money. And without demonetization it can’t be cured. Modiji understands the discomfort of standing in the queue but like any major surgical treatment the pain is bound to be there”, Shri Shah said. He said, “The unaccounted wealth recovered following demonetization or the capital regained through stringent penalty imposed on unaccounted money would be utilized for the welfare of poor, tribals, Dalits, backwards, farmers, women and further development of the country”. “During our two-and-a-half year rule, there is no allegation of fraud and any graft charges. But the nation witnessed the corruption to the tune of 12 lakh crore during the Congress regime. Our party has launched 92 welfare schemes and the fight against black money” Shri Shah stated. The nation has witnessed four types of governments, Congress, Left supported, regional parties ruled and BJP governments and the political pundits should analyze which government has worked for poverty eradication and social and economic empowerment of people and which government has faith on development, he said. During Congress led UPA regime Pakistan was attacking Kashmir valley every day, but people were just waiting for permission from Delhi, he said adding when Pakistan fired at Indian territory, Prime Minister Modi ordered the army to give a befitting reply. “Today things are totally different. It was never a practice to retaliate. But we have given a befitting reply to Pakistan on its border,” he said. “Things cannot be seen by Rahul Gandhi as he is wearing Italian spectacle. Rahul baba has to replace his Italian eyeglasses with Indian spectacles to see all these changes,” BJP National President said amid applause from the BJP workers. Describing the demonetization move as a major step against corruption, he said the PM and the BJP are pained at the hardships caused to the people. “But, the move is essential to tackle menace of corruption and black money,” he said and added that the ill-gotten money recovered would be used for welfare schemes. Before November 7, all the opposition leaders Arvind Kejriwal, Rahul Gandhi, Mamata Banerjee, Mayawati, and Mulayam Singh Yadav all were questioning BJP government what it had done on black money. But from November 8, all these leaders have been asking Modi government “why have you taken action on black money,” Shri Amit Shah said. “All those people, who have lost their money, have been opposing the demonetization move. You can see the face of Mamata Banerjee,” said BJP President adding “But Modi government will not go back from its fight against black money and demonetization”. 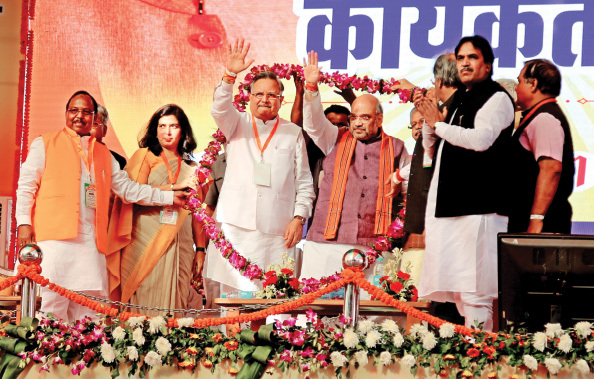 The BJP President praised the accomplishments of Raman Singh government. “From the backward BIMARU status, the Chhattisgarh state now is ranked among the most progressive States of the country under the leadership of Dr. Raman Singh,” Shri Shah affirmed. He exhorted the party workers to connect with each person with the BJP and carry the messages and achievements of PM Modi and CM Raman Singh among the masses to ensure the party returns to power in Chhattisgarh for the fourth consecutive term in 2018. On the Maoist issue, he said Chief Minister Dr. Raman Singh has nearly freed Chhattisgarh from Maoism, which was a good thing for the nation. BJP National President also congratulated the Chief Minister for completing 13 years in office. BJP believes in politics of performance that ensures repeat mandate for the party in various States. During the Congress regime of 60 years, the nation suffered from paralysis of black money. And without demonetization it can’t be cured. Modiji understands the discomfort of standing in the queue but like any major surgical treatment the pain is bound to be there. The unaccounted wealth recovered following demonetization or the capital regained through stringent penalty imposed on unaccounted money would be utilized for the welfare of poor, tribals, Dalits, backwards, farmers, women and further development of the country. During our two-and-a-half year rule, there is no allegation of fraud and any graft charges. But the nation witnessed the corruption to the tune of 12 lakh crore during the Congress regime. Before November 7, all the opposition leaders Arvind Kejriwal, Rahul Gandhi, Mamata Banerjee, Mayawati, and Mulayam Singh Yadav all were questioning BJP government what it had done on black money. But from November 8, all these leaders have been asking Modi government why have you taken action on black money. Ensure the party returns to power in Chhattisgarh for the fourth consecutive term in 2018.